Dr. Diamantis, a Board Certified Oral and Maxillofacial Surgeon, joined Lowell Oral Surgery Associates in 2010 and divides his time between our three office locations. Dr. Diamantis earned his dental degree from The University of Pennsylvania School of Dentistry, and his medical degree from The University of Pennsylvania School of Medicine. While at the School of Dentistry, he was the recipient of the Theodore Bloom Oral Surgery Award. He completed his residency in Oral and Maxillofacial Surgery and his General Surgery training at the Hospital of the University of Pennsylvania. Dr. Diamantis is a Diplomate of the American Board of Oral and Maxillofacial Surgery and a member of the American Association of Oral and Maxillofacial Surgeons. He presently serves as President of the Greater Lowell Dental Society, and as Chief of Dentistry at Lowell General Hospital. 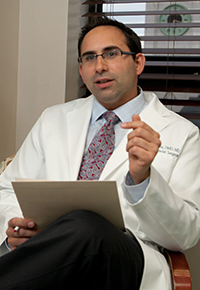 Dr. Diamantis is also a staff surgeon at Lowell General Hospital and Lowell General Saints Campus. He has courtesy staff privileges at St. Joseph's Hospital in Nashua. In his six years working for our practice, he has seen the practice grow and thrive, and has touched the lives of many patients. He says, "I love seeing how pleasantly surprised patient are after they have had their procedure."